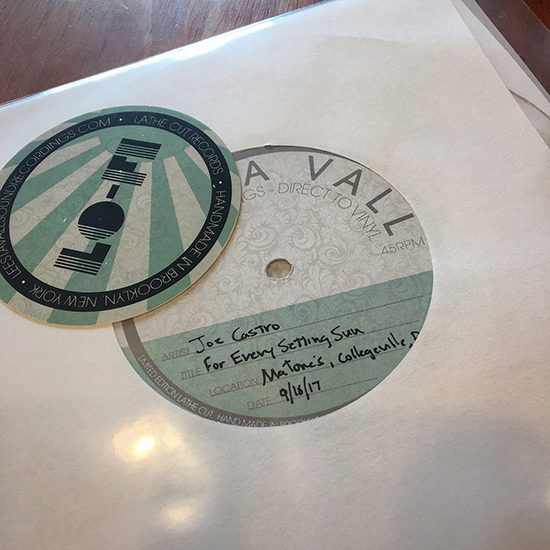 This past Saturday (September 16), I was lucky enough to record a new song as part of Leesta Vall’s Direct to Vinyl Field Recordings. Brooklyn based, Leesta Vall specializes in limited edition lathe cut records that are made on modified vintage record cutting lathes. Basically, they set up the machine in the shop, you come in and perform your song – live and raw, one take, two mics – and 60 seconds later you’re walking out the door with a one of a kind vinyl record of the performance in your hands. It’s reminiscent of the novelty recording booths that were popular in the 1920s-50s, where, pre-cassette tape era, it was the only way the average person could hear the sound of their own voice. The session took place at my favorite record shop, Matones Music in Collegeville, PA – a location I’ve performed at a number of times recently as part of their monthly open mic gatherings. The owner Adam is working hard to build a scene there and the shop has become a bit of a home base for local musician. Matones is a gem and the real deal for sure – definitely worth the trip if you’re into vinyl. They also have a few of my gig posters hanging on the wall as well. The song I recorded is entitled For Every Setting Sun. 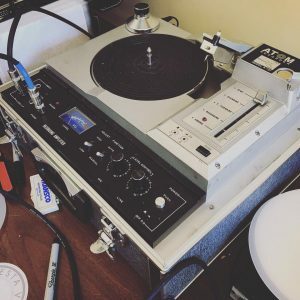 I transferred the vinyl to digital via a USB record player and uploaded it to soundcloud for your listening pleasure. I hope you dig it. The song was written this past summer and has not appeared on any official release as of yet. I’ve been in the process of writing a handful of new songs as well as putting a new band together with the goal being to play more shows and release more records. More to come on that front so please stay tuned.